The American Indian is of the soil, whether it be the region of forests, plains, pueblos, or mesas. He fits into the landscape, for the hand that fashioned the continent also fashioned the man for his surroundings. He once grew as naturally as the wild sunflowers, he belongs just as the buffalo belonged…. The history of the American West is obviously never complete without the tales of the many Americans who first lived on these vast lands. Here, you’ll find summaries of many of the chiefs, heroes, warriors, and medicine men that history records as significant in the westward expansion of the United States. Though there were literally thousands of men and woman that could be mentioned, this ever-growing list of individuals begins with those most famous. Adoeette, aka: Big Tree (1845?-1871) – Known as Adoette to his Kiowa tribe, he was known to the white man, as “Big Tree.” See Article HERE. American Horse (1800-1876) – American Horse, an Oglala Sioux chief, he was one of the principal war chiefs during the Battle of the Little Bighorn. He was killed by General George Crook’s troops in 1876. See Article HERE. Big Bill – A Paiute chief, Big Bill led the Indians who aided the notorious Mormon John D. Lee in the Mountain Meadows Massacre in southwest Utah on September 11, 1857. Big Foot, aka: Sithanka, Spotted Elk (1826?-1890) – A Hunkpapa Sioux, Big Foot was the chief of the Cheyenne River Reservation. He was killed on December 29, 1890, along with almost 300 other members of his tribe, at the Wounded Knee Massacre. See Article HERE. Black Elk (1863-1950) – Known as Hehaka Sapa to his people, Black Elk was a famous Lakota holy man. He participated in the Battle of the Little Bighorn when he was just 12 years-old. In 1886 Black Elk joined Buffalo Bill Cody’s Wild West Show and toured eastern cities and even Europe. In 1890, he was wounded in the massacre that occurred in Wounded Knee in 1890. Living on the reservation, he was baptized as a Catholic and took the name Nicholas Black Elk. Serve as a spiritual leader among his people, he saw no contradiction in what he found valid in both his tribal traditions and those of Christianity. 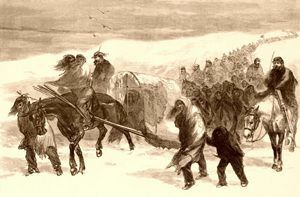 He then began to travel helping to convert Arapaho, Winnebago, Omaha and others to Christianity. 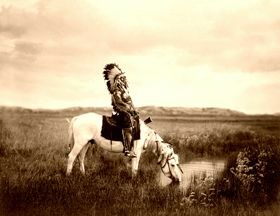 In later years he combined his missionary work with showmanship at various tourist attractions in South Dakota, using his reputation as a Lakota holy man to draw visitors. He died in August, 1950. 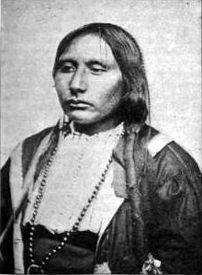 Black Kettle (1803-68) – Peaceful leader of the Southern Cheyenne tribe. Killed by General George Armstrong Custer and his troops at the Battle of Washita. See Article HERE. Chief Bowl (1756-1839) – Known to the Cherokee as Diwal’li, Bowl led his people to Texas and was killed at the Battle of the Neches. See Article HERE. Edward “Ned” Wilkerson Bushyhead (1832-1907) – Bushyhead was a Cherokee miner, publisher, and lawman who traveled on the Cherokee Trail of Tears to Oklahoma and later became the Chief of Police in San Diego, California. See Article HERE. Cochise (18? ?-1874) – Apache Chief and one of the last holdouts in resisting white settlement. See Article HERE. Crazy Horse (1842-1877) – A brave and skilled warrior, continually resisted white encroachment into the Black Hills. See Article HERE. Crow Dog (1833-1910) – One of the leaders who popularized the Ghost Dance among the Lakota. See Article HERE. Natawista Culbertson (1825?-1895) – Natawista, the daughter of a Blackfoot chief, married fur trader Alexander Culbertson and worked as a diplomat, a hostess, and an interpreter. See Article HERE.